Monday. After a 4-day holiday (home made play dough, visits to the beach, visit to a steam train, going out to lunch, putting up our tree…..). We were a bit rusty this morning. I woke up super early since I thought I had to take an earlier ferry into the city today for an early conference call. I showered, got dressed, and 5 minutes before I was about to leave I checked my email on iPhone. Good thing I checked because the meeting was cancelled! But I had to coordinate with my admin to push back a second meeting since I would be a bit late for that. So, this morning was already a juggling act for work. Red woke up first, happy. I heard Twin Husky saying “Mommy… mommy….mommy!!!”. He was walking up the stairs trying to find me. I love this with him. We’ve recently gotten much closer and I love it. Twin Crazy was busy with oatmeal all over her mouth and cheeks (so cute) and also busy bringing around the “new” Christmas stuffed animals from room to room. Twin Husky was transporting them too – using the toy shopping cart. I was busy this AM finishing some laundry – getting bags packed for the kids and linens for sleep time. The kids were in a great mood since the tree was up. Everyone wanted to get changed and ready in the toy room where the tree was. It’s amazing what some lights and little ornaments do for a small child. Wonderment. 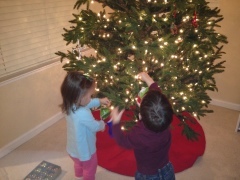 And the Twins this year are 22 months old so this is somewhat new to them… they didn’t really “get it” last year. This year, they were helping with the decorations, pulling the decorations off of the tree, eating the gel decorations off of the windows, etc. So cute. We divided drop offs this AM. I took Red. She was clingy. It was a rough drop off. We talked about the home-made play-dough we made over the weekend, the book that she brought to school, but she was still clinging on to me and reaching out to me as I left. I think many kids were having a rough time adjusting to “school” after a 4 day block of time at home with their families. So now I’m on the “normal” ferry and headed through the fog to the city. Although my first meeting was canceled, I still have 3 other back-to-back meetings as soon as I get in. And one will be pushed back a bit because of me and my schedule. These are one-on-one feedback meetings, and I need to go “heads down” and focus on my client deliverable for the rest of the day. There are many emotions going through me lately. I am really happy with my work arrangement, for the first time in years. I feel like I have the balance that I need and that my family needs. My older kids talk about my “home days” and I’m already thinking of the kinds of activities I want to do with the Twins. Things they can’t do at their current daycare. Puzzles, reading, excursions to museums, going to the library, or just rolling around and playing with Mommy. It’s all good. This was a move in the right direction for my life, my happiness, and the experiences for my kids. It was a good, busy day. I led 1:1 feedback calls with two members of the 2nd forum I am managing. This is with a separate Director and he found the calls to be extremely valuable, and he personally thanked me for initiating the process. This forum has been running for 20 years and I’m trying to take a different approach where it makes sense to do so and these 1:1s are important to me to make sure we’re providing the right value to the group and also for me to develop relationships with the leaders of the companies. I [finally] started to devote real time to my client project and develop the thinking into the presentation we will provide to them. I enlisted help of more junior staff to help me fill in the pieces so I think this will go much quicker than I originally planned. Whew!! I led a team “re-group” where we got together to talk about business proposals, client work, team availability, and learnings as they relate to sales or even the debrief learnings from my 1:1 sessions with our forum clients. For the rest of the day, I spent more time on the client project, and also had to handle some administrative items, including getting ready for tomorrow – I have another day of back to back meetings; some debrief, some sales. I’m finding that with this new work routine I need to prepare the day before since my days are generally filled with meetings – squashed into 2.5 days. I am now waiting for my appointment. I am feeling generally very good about things. I feel like my work is headed in the right direction. I’m thinking about the doctor appointments I need to schedule for the kids (and dentist). I feel like I’m getting my routine better coordinated and can go through these weeks with more confidence. I will miss my kids tonight though. I will probably have some time with Big Bro and Red, but not much time. So hugs and kisses and quick conversations about their day will have to suffice for now. My goal will be to connect with each of them and really listen to what they have to tell me – not just quickly say goodnight to them. Maybe I’ll ask each of them if it was good to see their friends today after the long weekend, and what did they specifically do with their friends that made them laugh. I like that.